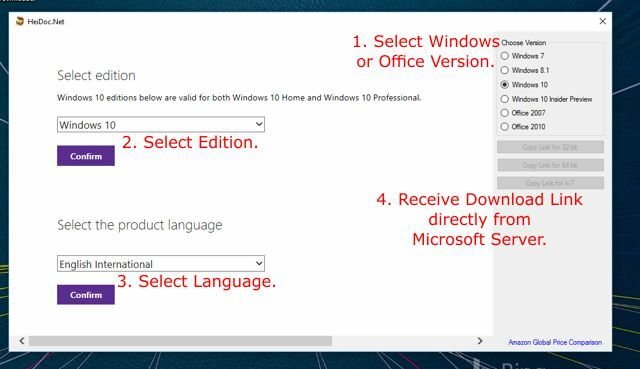 This new tool allows an easy and comfortable way to download genuine Windows 7, 8.1 and 10, as well as Office 2007, 2010 and 2011 disk images (ISO) directly from Microsoft's servers. Ever since Microsoft pulled the Windows disk images from Digital River, hunting for untouched ISO files has been a pain. Our new tool will make your life easier, and provides and interface to Microsoft TechBench to download original Windows images directly from Microsoft's server. Handy tool. I did notice Windows 7 was not available with this of recent, but this update does offer some Windows 7 versions as per their site, and will add more if all goes OK.
A useful little utility that works perfectly. And it's free! Pros: 'does what it says on the tin' but some builds of releases are not available that in some cases are those that are likely to be needed the most. Cons: The app tries to inject registry keys to modify internet zone security, why?